Clank! is a competitive deck-building game, with a game board. 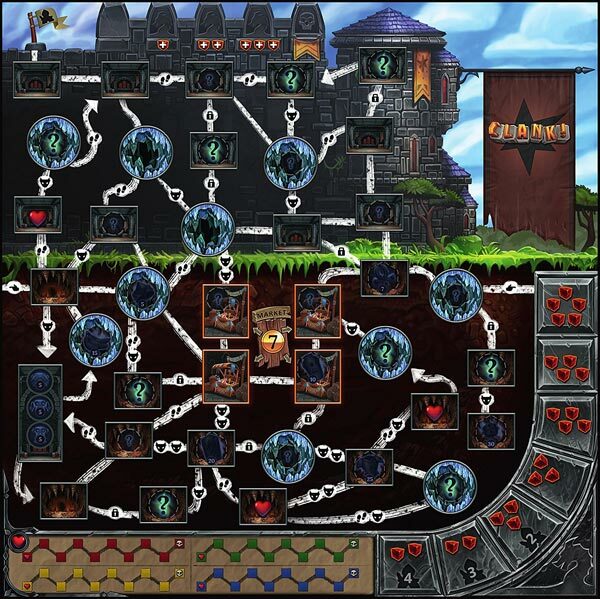 It’s a dungeon-crawling board game for 2 to 4 players, and is made by Renegade Game Studios. The goal of the game is to delve into the dungeon, steal some artifacts, and get out before the dragon roasts you. 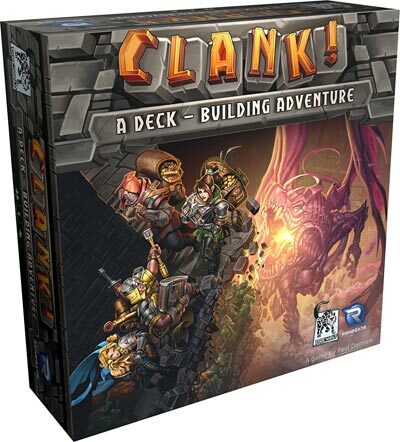 The term “Clank!” is used in the game to represent the noise you make while sneaking around the dungeon. Every time you make a clank, you increase your odds of getting discovered by the dragon living in the dungeon. The only way to win the game is to go into the dungeon, steal an artifact, and make it out alive. The thing is, is that everyone has the opportunity to make it out alive, so the winner is the person who has stolen the best loot, and still made it out alive. Loot is scattered all around the dungeon along with various potions, boosts and other goodies. On your turn you will play the Top 5 cards from your deck. 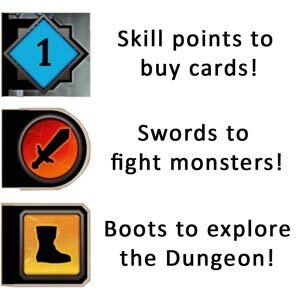 The cards will allow you to move through the dungeon, fight monsters in the dungeon, and generate skill points to allow you to buy more cards for your deck. Everyone starts off with the same 10 cards, but each person will buy cards during their turn to add to their deck. Your deck will become more powerful as the game goes on. Your new cards will allow you to move farther and faster during your turn. The cards will also allow you to fight monsters easier, and generate more points to buy even more cards. Many times your moves will generate “Clank!”, slightly disturbing the dragon. Every time you generate Clank!, you will add one of your Clank Cubes to the Dragon Bag! What’s this about a Dragon? There is a Dragon Bag starts off with 24 black dragon cubes in it. Every time someone generates clank they will add clank cubes into to the dragon bag. Several times during the game, players will accidentally disturb the dragon, and she will attack anyone still down in the dungeon portion of the board. During a dragon attack, players will draw a designated amount of cubes from the Dragon Bag. At first, you will only draw 2 cubes every attack. If a black cube is drawn, everyone is safe. If your colored cube is drawn, you’ve taken damage. If you take a total of 10 damage during the game, you’re game is over. If you take your 10th damage below ground (inside the dungeon), you have died and cannot win the game. If you take your 10th damage above ground, you are knocked out and the townspeople will carry you to safety. If you successfully steal an artifact, are not knocked out by the dragon, and successfully get away, you are awarded bonus points. Any time anyone steals an artifact, or disturbs a dragon egg, the dragon’s rage increases, and you will pull more cubes from the Dragon bag. Near the end of the game, the dragon will be crazy enraged, and you will be pulling 5 damage cubes from the bag! 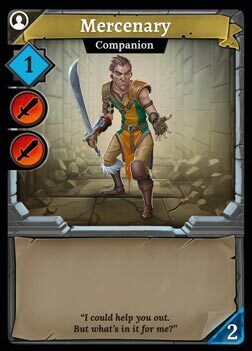 Skill Points – Allow you buy more more cards for your deck. Card cost is on the bottom right hand corner of each purchasable card. There are also Gem Card, Device cards, and more. Pros and Cons of Clank! Great Presentation – The box, board, cards, tokens and cubes are high quality and feel great. Huge Two-sided game board! – I like that they printed two game boards in one box. There are two different dungeons to crawl. Price is right – The Price feels right for everything you are getting in this box. The suggested retail price is $60, but you should be able to find it for under $50 by scouting around. Click here to check the current price on Amazon. Deck Building – Each game will have a different feel to it, because every time you play it, your deck will be built completely different. 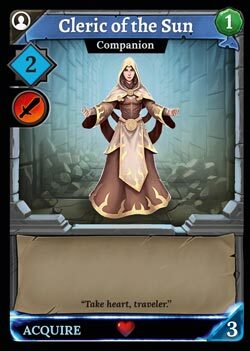 You can try to build a deck that kills monsters, or a deck that moves stealthily through the dungeon, or a deck that generates a lot of fast movement, but also makes a tons of noise (clank). 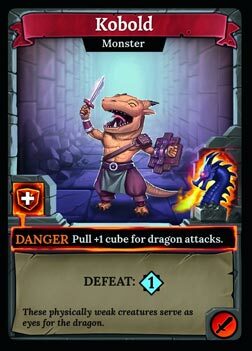 Gameplay is fun and tense – The game starts off mild, but as the game moves toward the end stage you will biting your fingernails hoping your Clank cube is not drawn during Dragon Attacks. Expansions! 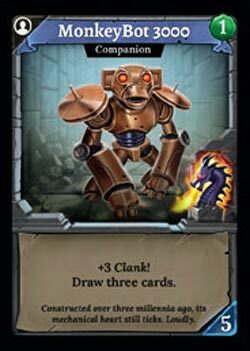 There are already two expansions for the Original Clank! – Clank! 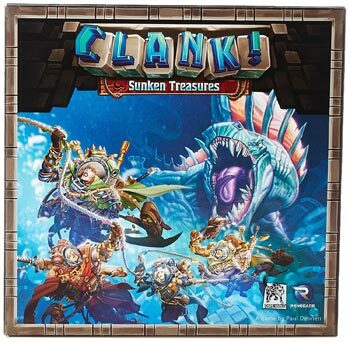 Sunken Treasure and Clank! The Mummy’s Curse. Each expansion comes with a 2-sided game board and more cards to add to your deck. The expansions are also reasonably priced at like $20 each. Multiple Strategies to Win – You can try to grab an easy artifact and get out, or you can dive deeper to get a very valuable artifact. You can fight monsters for rewards, or you can bypass monsters. 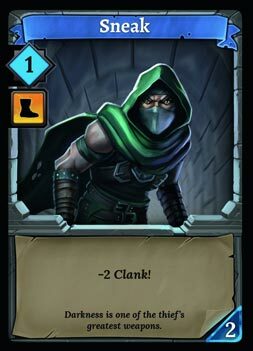 You can make a slow sneaky deck, or a fast loud deck that generates a lot of Clank. Luck! – Luck plays a factor when taking damage. The randomness of whose cube is coming out of the bag is fun, but it also can be frustrating. There might be 20 cubes in the dragon bag, and your might have only 2 cubes of your color in the bag, but your two cubes might be the only ones pulled out. The odds might be in your favor, but Lady Luck might not be on your side. Permanent Death – Once you die, you are out of the game. Lady Luck might really have it out for you, and you can be watching on the sidelines the last few minutes of the game. Crap cards might be out for purchase during your turn. There is always a row of 6 different cards available for purchase on your turn. Some cards are better than others, and your opponents might beat you to the cards you really want. Game can feel slow at times with 4 players. The box states the game takes about 60 minutes. This feels about right, but you don’t really do anything during other players turns except observe. The game actually feels better with 3 players to me. I don’t know why, but there’s something fun to me about moving your character through a dungeon maze. If you have played any Trading Card Games (MTG, Pokemon, YuGiOh, etc.) then you will find it fairly easy to pick up the deck-building mechanism. If you have not played any deck-building games, this is a good place to start. The deck-building mechanic isn’t as tough as some other deck-builders I have played. Your choices can be very dynamic during the game. You might have had a plan to grab a certain artifact and get out. 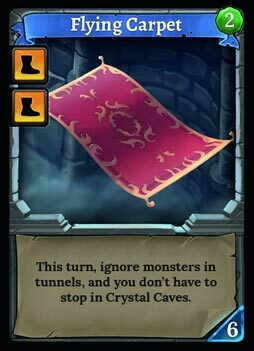 But an opponent might be moving through the dungeon faster, and have the same plan. You will have to alter your plan, which is fairly easy since the dungeon is essentially a maze of options. The best loot is all the way at the bottom, but dare you risk it … and will you be able to get out before the dragon eats you? The tension near the end can have you on the edge of your seat. Everyone is rooting for someone else’s cubes to get pulled out of the bag. This is a fun game that is easy to recommend. My gaming group has played through this game many times, and we’ve enjoyed every game. And if you get bored with the 2 dungeon boards provided with this game, go out and buy of the others. Oh, and if you don’t like the Fantasy Dungeon Theme, Renegade Games also now offers “Clank in Space”, which might appeal to you more if you’re into the Space Science Fiction theme.